CHICAGO—Whether it is increasing political transparency, police accountability or pushing economic development and reinvestment in financially depressed neighborhoods where crime is rampant, many question whether Mayor Rahm Emanuel can withstand blistering attacks and corruption charges that show no signs of letting up. Police culture has to change, they argue. The well-publicized police-involved shooting of 19-year-old Quintonio LeGrier and neighbor Bettie Jones is a “perfect example” of the type of event that creates tension between the community and police. The teen’s father had called for help with his son, the downstairs neighbor opened the door and she and the son were shot to death by police. “Somebody’s helping police and they get killed. What message does that send to the city? People are afraid to call the police. They are afraid to deal with them because they don’t know what is going to happen to them. 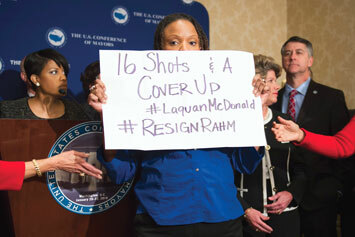 We have to understand this is a broken trust and it is a lot deeper than this one incident,” Father Pfleger said. Almost daily there is news of a fatal shooting involving multiple individuals usually on the city’s South and West Sides. There have been several well-publicized shootings on the city’s expressways in which one car drove up next to another and emptied bullets into it wounding passengers in the other vehicle. There have been two shootings at swanky luxury hotels that often host conventions and are typically filled with tourists. The crime problem is just one of the issues Mayor Emanuel is responsible for solving. The city’s residents—those not calling for his resignation—are wondering whether he will be able to survive it all politically. Police and the politicians who unquestionably back them are quick to blame the shootings on thugs who have little regard for human life. Activists and organizers have been told to “trust the system” but in many cases, the system does not work. Rarely is there an examination of the educational, social and political issues contributing to an environment fraught with a lack of opportunity and few services. “We’ve got to change the culture. If we don’t change the culture, then guess what, nothing changes, and if we don’t get in our communities, the economic development, the options and the good education and end this huge unemployment problem—we can have the best police department in the whole damn world. If we don’t have our communities taken care of, we’re going to still be in the same situation with people with no options,” said Father Pfleger. A report by University of Illinois at Chicago researchers commissioned by the Alternative Schools Network found 47 percent of Black men between the ages of 20 and 24 are neither in school nor working. It was no surprise that the highest concentration of youth joblessness was found on the city’s South and West Sides. “There is a direct correlation between crime and unemployment. And the unemployment rate of Black males has reached a crisis point,” said Cook County Commissioner Richard Boykin reacting to statistical data found in the report. Some of Mayor Emanuel’s critics have charged him with only being the mayor for the wealthy and those with business interests. 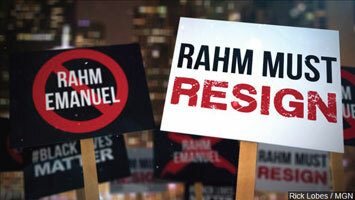 Others have begun calling him the “cover-up king.” A December 2015 Illinois Observer online poll of likely voters found the mayor’s approval rating hovering at around 18 percent with a disapproval rating of 67 percent. There are weekly protests—some even in front of his own home—demanding his resignation. Though he is clearly weakened politically, it doesn’t appear he is going to step down. At the same time, there have been announced policy changes that the Emanuel administration will undoubtedly identify as steps towards reform. The mayor announced the number of Tasers would be doubled to 1,400 with the goal of every police car being equipped with a Taser to use in deescalating confrontations. Out of a police force of about 12,000, only about 1,860 officers are trained in Taser use. The police department announced every officer responding to a call for service would be equipped with a Taser and trained to use it by June 1, 2016. “I was shocked to hear that there were so few Tasers out here. I thought every police had a Taser,” said Father Pfleger. In the midst of daily protests on the Magnificent Mile, Mayor Emanuel also announced an expansion of the body camera program. Six additional districts—on the South and West sides of the city—would be added to the program. Currently only one police district—the Shakespeare District 14—is capturing data from body cameras. The expansion is scheduled to fully launch in early spring, and will cost approximately $2 million with $1 million coming from the U.S. Department of Justice, according to the mayor’s office. 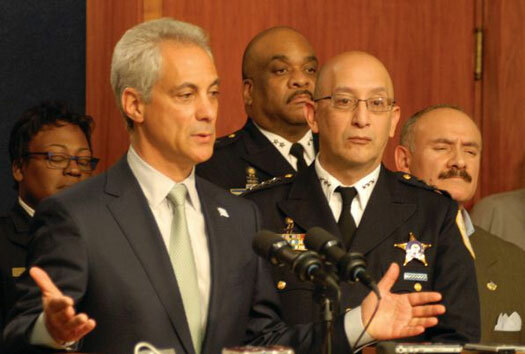 “Increasing public safety, improving transparency, and building trust in our police department are three key priorities, and the expansion of the body camera program is a significant step forward for each,” said Mayor Emanuel. A large segment of the city’s population consisting primarily of Blacks and Latinos have no trust in the police department and no faith in the political officials given responsibility to govern. Aleta Clark, founder of the anti-violence group Hugs No Slug, is regularly at protests working to stop Black on Black crime, while at the same time fighting police brutality. “If we’re held accountable for speeding tickets” everyone else, including Mayor Emanuel, should be held accountable for their actions, she said. Regarding the shootings of unarmed Blacks in Chicago and nationwide, “I don’t feel that cops should aim to kill if a person is running away or whatever the case is,” Ms. Clark said. The Chicago Police Department has launched a heavy recruiting effort in Black and Latino neighborhoods with billboards popping up throughout the city and bilingual handbills distributed in numerous locations. One of the problems with the release of the Laquan McDonald shooting video is that it lacked audio. Although it could not be proven beyond the shadow of a doubt, many believe the missing audio was intentional on the part of patrol officers and/or police department higher-ups. Interim Supt. Escalante announced the department’s intention to increase inspections of dashcam video equipment and its usage. “We have made it clear to the officers in our department that while technology may be an obstacle to fully functioning dashboard cameras, any officers who knowingly turn off the audio function or otherwise does not follow department policy related to this equipment will face discipline,” said Interim Supt. Escalante at a recent special meeting of committee chairs and public safety officials. Any officer who lies in the course of duty, files false case reports or covers up wrong actions of others will be terminated, he vowed. Sounds good right? The reality reveals something different. 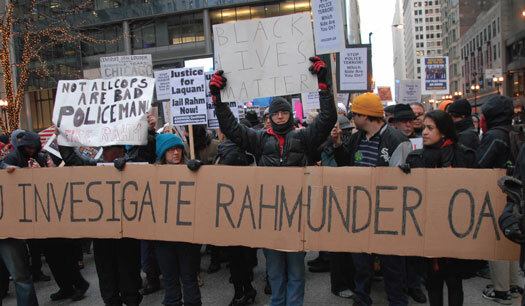 E-mails dealing with the mayor’s office and the handling of the aftermath of the Laquan McDonald shooting, and an examination of the reports of the officers present on that night revealed obfuscation of facts and attempts to quell anticipated outrage once video footage was released. The Black teen was shot 16 times as he walked away from police officers. It was determined that at least two officers—one of whom was the lead detective in the case—filed reports that differed greatly from what was seen on dashcam video. Detective David March and Officer Joseph Walsh have not been fired. Both still have full police powers, which includes permission to carry a weapon and make arrests. Only by mid-January, after a recommendation by the Inspector General Joseph Ferguson, were the officers taken off the street and moved to administrative duties. It was known in the weeks after the McDonald shooting that their reports differed greatly from what video footage shows transpired on that fateful night, October 20, 2014. Their reports back Officer Jason Van Dyke’s story that the Black teen was threatening him with a knife and he fired in self-defense. Mayor Emanuel has avoided saying much about the Homan Square facility, referred to by activists as a CIA-style “black site,” or a secret place where people are detained and denied basic rights. In the Chicago Police Department’s own words, calling the onetime warehouse a secretive holding facility appears to be accurate. 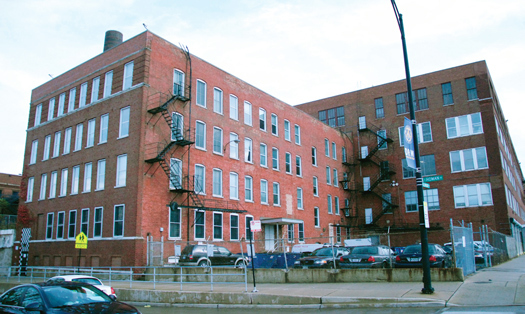 Hearings on Homan Square were recently held and several residents are suing the city for alleged human rights violations. 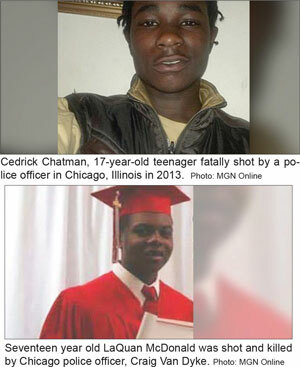 Video of the shooting of 17-year-old Cedrick Chatman, killed by police on Jan. 7, 2013, again raised the ire of community activists. The city’s Independent Police Review Authority (IPRA), a body set up to investigate police-involved shootings said the shooting was justified. But IPRA has been controversial since its inception and widely criticized for ineffective work in probing police misconduct. Lorenzo Davis, a former IPRA investigative supervisor, said he was pressured to change his findings that many police-involved shootings did not warrant use of lethal force. His conclusions, likely unpopular with the upper echelon of the police department and some city officials, resulting in him being fired, he said. Mr. Davis has called for federal investigations into his claims related to IPRA. He had ruled the Chatman shooting was not justified, but charges superiors tried to pressure him into changing his stance. He refused. The resignation of IPRA’s chief administrator, Scott Ando, was announced by Mayor Emanuel Dec. 6, 2015, in the middle of the Laquan McDonald fallout. Sharon Fairley, another insider, who was first deputy and general counsel in the city’s Office of the Inspector General was named Mr. Ando’s replacement. The Chicago Police Department’s chief of detectives, Constantine “Dean” Andrews, resigned Dec. 7. Police chief Garry McCarthy was fired Dec. 1. And then there is the case of Darius Pinex, who was killed by police January 7, 2011. The officers involved in his death were found not guilty in February 2015. But it was revealed that city attorneys intentionally concealed important evidence that legal observers believe would have altered the jury’s decision. Atty. G. Flynt Taylor of the People’s Law Office has represented victims of police brutality and misconduct for decades. There are political officials who clearly do not want information regarding police misdeeds and corruption to become known, said the activist attorney. With decades of working to bring misconduct to light, he is unsurprised by revelations that police filed false reports or used institutional loyalty to shield dirty practices. “The police would find ways to make their unconstitutional and illegal activists secret in an ad hoc way,” said Atty. Taylor. “I think after you’ve been not only an observer but a participant in fighting against all of the torture and assassinations and shootings and all of that over the last 45-years, you’re not surprised unfortunately,” he added. Although problems with crime and police corruption predated Mr. Emanuel becoming mayor of Chicago, it is now his problem, and many believe ultimately, it could lead to the end of his political career. However, the problem is also beyond simply the mayor or political officials; it is a systemic issue, Atty. Taylor noted.